The Miktek C1 large diaphragm FET condenser will impress the most critical listeners and inspire artists to create their best performance. The microphone features a tightly controlled cardioid pickup pattern, a high-pass filter and –10dB pad for recording loud sound sources. The frequency response is broad and musical, characterized by a warm and rich bottom end and silky-sweet trebles, yet with a natural and open midrange. The microphone produces amazing results when recording acoustic instruments, guitar amps, or with overheads on a drum kit. 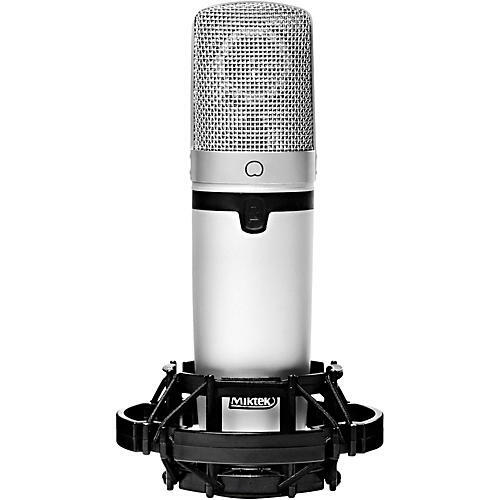 The C1 truly excels on vocal ­applications. The C1 utilizes the new MK capsule developed by Miktek engineers, featuring dual 1” diaphragms made using 5-micron Mylar with a 0.4-micron layer of evaporated gold. The diaphragm is precisely tensioned and mounted to a carefully- tuned backplate to create the finished capsule. In addition, the innovated head amplifier design features a unique circuit that allows the engineer to switch the capsule bias voltage from +48 to +60 volts. This proprietary circuit implementation essentially provides the mic with two voices; allowing you to choose between a classic and modern microphone. At +48 volts the capsule’s diaphragm is under less ­tension, so it’s able to react to extremely subtle changes in sound pressure; enabling the microphone to capture the slightest nuances in any performance. When the bias voltage is set to +60 volts, the C1 is extremely accurate and articulate.